For more information on Chartboost Store, please visit www.chartboost.com/store. One of the biggest challenges facing mobile game developers is how to effectively monetize their games and build a lasting product. In 2010, only one of the top 10 grossing games on iOS platforms was free-to-play with in-app purchases. In stark contrast, just two years later, all of the top 10 grossing games on iOS were free-to-play. This drastic change in the market is due to developers being able to monetize their games through advertising as well as in-app purchases. With today’s announcement, Chartboost is the only games-specific business engine offering services in both of these areas of monetization. Chartboost Store provides built-in analytics that reveal transactional data for all items that are up for sale. Developers can then use insights from user behavior to update their in-app store, for example, changing prices or adding new items, from an online dashboard in real time. These features significantly benefit small mobile game developers who would normally need to build this technology from scratch and dedicate engineering resources to managing it. There are five games already live with Chartboost Store today, including Retro Dreamer’s Ice Cream Drop, Sniderware’s Eric’s Sudoku, Dobsoft’s Run & Gun, Trivial Technology’s Word Buster, and Naquatic’s Basketball Showdown. “We’re a small team, and building a backend service to provide the flexibility to make updates on the fly wasn’t something we ever considered before. Working with Store has opened our eyes to the possibilities going forward, thinking about how we can run promotions and regular content updates in our future titles. We’re already thinking different about building our games going forward,” said Gavin Bowman of Retro Dreamer. “Chartboost is powering my store in Eric’s Sudoku, currently featured in the board and puzzle game categories in the App Store. It was easy to integrate and my in-app purchases are off to a great start. I’m excited that I can change virtual item prices at any time and am definitely going to leverage Chartboost Store in my upcoming titles,” added Eric Snider of Sniderware. “We’re a two-man outfit and I’m responsible for all of the programming, so I’d much prefer to have the backend handled by experts. Chartboost Store opened my eyes to the potential of real-time updates not just in my game design, but for my in-app purchase strategy as well. For my new games, I really see the potential to make my virtual economy more relevant and more profitable,” said Will Dobson of Dobsoft Studios. 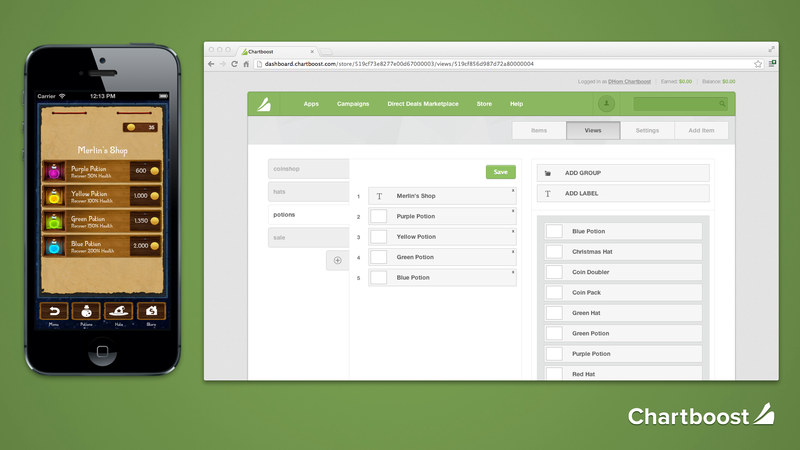 Chartboost Store is currently available in closed beta for iOS, Android and Unity. Interested developers can view a product demo at www.chartboost.com/store and can apply for the beta program at www.chartboost.com/storebeta. Store is free for developers in the beta program and will be available for a 10% revenue share after full launch later this year. Chartboost is the leading games-only technology platform that helps developers reach more users and make more money. The company powers over 16,000 games and works with companies like Backflip, Capcom, Com2us, Crowdstar, DeNA, Djnworks, Fluik, Gameloft, Gamevil, Get Set Games, GREE, Kabam, Kiloo, King, Natural Motion, Neon Play, Nimblebit, Outfit7, Pik Pok, Pocket Gems, Supercell, TinyCo, Wooga, Z2labs and many more. The Chartboost network reaches over 300 million unique monthly devices and drives over eight billion game sessions per month. Headquartered in San Francisco and with a European office in Amsterdam, Chartboost was founded in 2011 and has raised a total of $21M from Sequoia Capital and other investors. For more information, please visit www.chartboost.com and read the Chartboost blog at blog.chartboost.com.